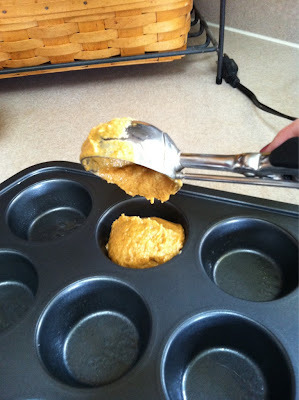 I am not a Pampered Chef distributor, so there is no personal gain when I say, Pampered Chef muffin tins are hands down, THE VERY BEST pan out there for baking muffins. I do spray them with a bit of Pam, but the muffins just fall out of them when they’re done. Another tool that I cannot say enough about is my “scooper”. I have these in all kinds of sizes and use them as much as I possibly can. I love the uniform size and shape that I get when I use a scooper! Somewhere I’ve read that if you have any extra spaces in the muffin tin, fill it with some water before baking. I guess this is better for your pan. I’m not sure of the technical reason, but it sounded good to me, so when I doubled this recipe, and there was only enough dough/batter for 23 muffins, I went ahead and filled the last space with water before I baked it. The finished product! I thought these would be too sweet with the chocolate chips, but they are amazing! I will definitely make these again. 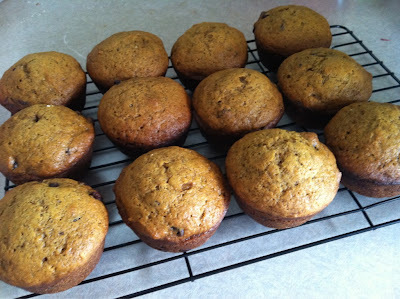 Since I had all the ingredients out, I decided to try another Pumpkin Muffin recipe, which I’ll show in my next post. Preheat Oven to 350. 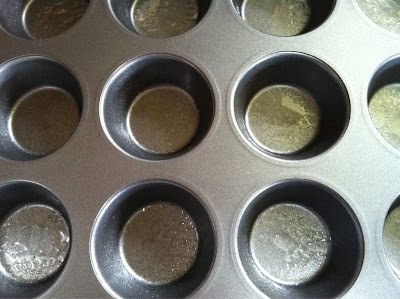 Grease or line muffin tin. Combine dry ingredients & set aside. In large bowl, beat eggs. Stir in pumpkin, melted butter & chocolate chips. Blend well. Add dry ingredients, stirring just until moistened. 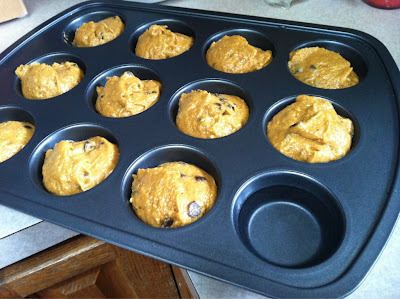 Spoon into muffin tins. Bake 20-25 minutes. These are really sweet and yummy. Can almost be a dessert.